NBC has set its late night lineup through the next decade. NBC extended the contract of Seth Meyers as the host of NBC's "Late Night" through 2021, the network announced on Wednesday. Meyers' extension comes after NBC signed Jimmy Fallon as "The Tonight Show" host through 2021 back in August. "I can't thank NBC enough for continuing to support our show and this more than makes up for my disappointment in not getting cast in 'The Wiz,'" Meyers said in a statement. Meyers has been a NBC night owl for decades spending many years as host of "Weekend Update" on "Saturday Night Live" before taking over Fallon's seat as "Late Night" host in February 2014. However, Meyers is a bit different than your average late night fare. To start, Meyers doesn't do a standing opening monologue, opting to tell jokes from his desk. 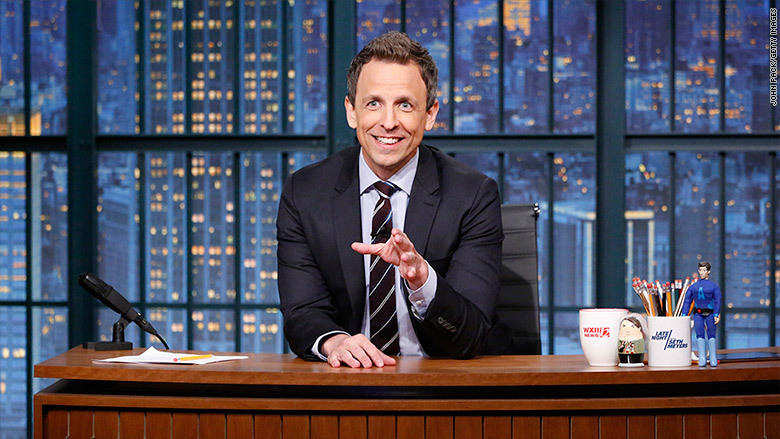 Also, Meyers' "Late Night" has more of a focus on current events than other late night shows. "His knowledge of both current events and pop culture is unparalleled and he brings that expertise to 'Late Night' every night," Robert Greenblatt, NBC's Entertainment chairman said in a statement. "The show couldn't be in better hands." NBC notes that the 12:30 a.m. broadcast often outperforms CBS's "The Late Show with Stephen Colbert," which broadcasts at 11:30 p.m. and that the show brought in 1.6 million viewers overall in the fourth quarter of 2015. The Meyers contract extension wasn't the only late night news NBC announced on Wednesday. The peacock network also announced that Fallon's "Tonight Show" would be heading to Los Angeles for five shows next month.